Make your design appear better by applying special effects to the drawing objects as well as texts. The software permits you to add drop shadow, reflection, 3D bevel, glow, transparency, contrast & a variety of special effects to your drawing elements. Make use of other tools to arrange, flip, scale & rotate the objects according to the desired output. Each vector drawing element such as a shape, symbol, text can be filled or stroken with a solid color, gradient colors, an image or a pattern. In addition, many objects can be grouped together to be treated as one. Provides visual path editing tools for creating unique vector graphics. With which, it is easy to add, delete, move nodes/segments for an existing path in a shape freely. More than hundreds of dash styles are provided to be used for stroking shapes as well as texts. Each drawing element is painted very smoothly. Mix all of them like texts, pictures, logos, shapes and more, adding eye-catching graphical styles using one-click presets and intuitive tools for the way to create amazing publishings. Works like a great vector graphics editor that supports strongly layer-editing. Enables you to add your own images, texts, maps, vector shapes, logos etc.. and arrange them as you like. all common image formats are supported strongly so you can import your own pictures, logos and clipart to design the perfect custom business publishings. The program has a family of full-color, customizable, and easy-to-use design templates. Choose from a plethora of different themes and color schemes. Then add in your own text, insert your images, print and distribute. 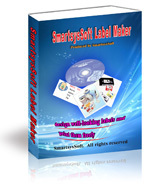 SmartsysSoft Business Publisher contains an all-embracing range of stunning clip art, logos, shapes, symbols you can select from. It also contains a range of backgrounds, gradient style, textures to give the design a unique appearance. The application's interface is attractive and quite intuitive，supports Undo and Redo anytime and anywhere. With moving mouse button you can create, move, resize,drag or rotate each drawing elements visually and freely. offers cut copy paste functionality for all the design elements. You can also copy paste texts and images from other applications. 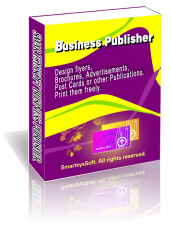 Select from a range of printing alternatives for your publishings. The tool has tiling feature which helps you to fit many pictures on a single paper. You can save your pictures in quality format to take print out from a better quality printer. Makes it easy for you to print your artworks either with any local Windows compatible printer or in professional print shops. Save your designs to high quality images as PDF, BMP, JPEG, GIF, PNG, TIFF formats for outside quality printing with maximum output of 600 dpi. You can also choose 300 dpi if you want.